Local media reported that a January inspection of the bridge found corrosion problems on the pillars. At the time, the government didn’t think the problem was serious enough to close the span, but did request funds for emergency measures, the reports said. 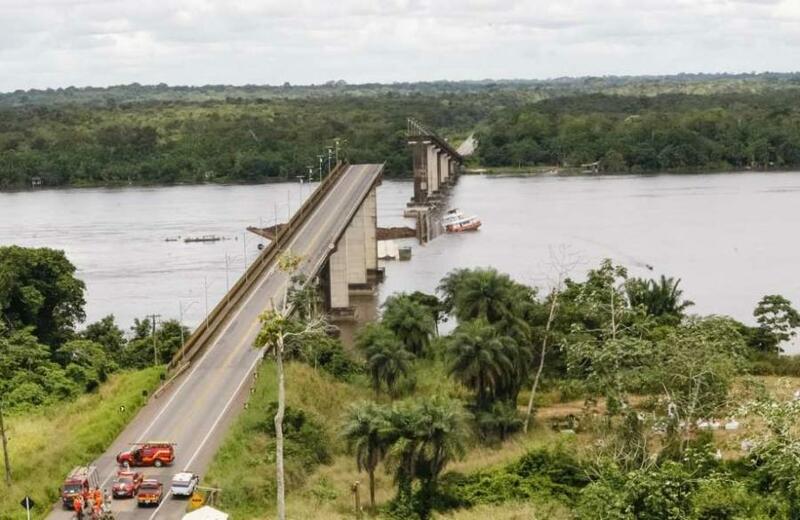 RIO DE JANEIRO (AP) — A ferryboat collided with a bridge pillar in Brazil's Amazon region April 6, causing the span's central roadway to plunge into the Moju River along with two cars and cutting a highway to one of the country's busiest ports, authorities said. Para state Gov. Helder Barbalho told reporters that witnesses reported seeing the two small cars fall into the water during the accident on a highway leading to the port city of Belem, the state capital. It was unknown how many people were in the cars, and fire department scuba divers were searching the river. The state government said the five crew members on the ferry survived, but it had no information about any victims as about 650 ft. of the half-mi. bridge collapsed. "This is a sad day with this regrettable episode," Barbalho said in an initial statement. "Right now our priority is to speed up the search for the victims and give total support to their families." Local media reported that a January inspection of the bridge found corrosion problems on the pillars. At the time, the government didn't think the problem was serious enough to close the span, but did request funds for emergency measures, the reports said. The structure is part of a complex of bridges that span a labyrinth of rivers at the mouth of the Amazon river basin to provide a road connection between many rural cities and the state capital. The state government said it would install ramps and have barges ferry cars from one end of the broken bridge to the other while the span is rebuilt. The governor estimated repairs and new safety measures would cost $25 million and take about year. Barbalho also said officials would install buffers and warning signs on the pillars of other bridges in the complex. In 2014, a boat collided with a pillar of another bridge in the same bridge complex, causing about 160 ft. of the span to collapse. Civil police were investigating the April 6 accident and looking into whether the ferry was officially registered.